We are pretty far off the beaten track for the thread topic, but as a side note I've started using an e-doctor service here in BC. I just log in on my computer and usually within minutes I am video conferencing with a doctor and so far have been totally satisfied with the service. Saves me time and money. Saves the doctor time and money. I am more likely to see a doctor because the hassle is next to zero. So I stay on top of anything that's bothering me rather than waiting until it's a more serious issue. Overall this should be a significant savings to the health care system as it gets adopted more widely. Canada is talking about various pharmacare/dental care programs where the government is the sole buyer and can negotiate amazing rates on drugs and services. Then it gets paid for with taxes and possibly income tested fees. I hope that goes through. It has the potential to save the country and massive massive amount of money and result in a much healthier population when nobody is choosing between rent/food and RX drugs/dental care. yep teladoc is now offered by my insurance company and our company encourages us to use it b/c it lowers costs taht they directly pass on to the rates we pay. Sure, but the cost of health care is one of the biggest worries stopping people from retirement. This can upset the most carefully laid 3-4-5 percent fiduciary plan. It is a major worry with the 4 percent rule. Not really. It's a budgeting issue. The 4% Rule says if you take 4% inflation adjusted out of your initial stash historical data provides a success rate looking backwards to help assess your plan. The 4% Rule never considered the fact your budget estimate may be incorrect and you spend more than you planned. Not really. It's a budgeting issue. Says he who has the better and cheaper health care. To be fair. I think if you have one of the better health care insurance plans in the US you get better health care. OTOH everyone in Canada has access to pretty good health care whether they have a lot of money or not. I prefer the latter system even if as a relatively wealthy person I could have better health care under the US system. I'm a one-for-all-and-all-for-one kinda person. You are both right in that it is a big concern for most FIRE people in the US AND it is a budgeting issue. The problem is that with ever increasing costs, potential changes to the political wills, higher deductibles, poorer access, and cliffs and scales for income it is really difficult to budget the RIGHT amount - it could range from nothing due to subsidies to next year being $25k for a family when factoring deductibles/coinsurance. I guess the conservative thing is for everyone to budget $25k then to be safe.....boy oh boy that will shred a $40k a year expense budget. That's why geographic arbitrage exists. I can live a higher quality of life WHILE travelling the world AND get the same quality healthcare if I threw 25k on top on my planned expenses. I can live a higher quality of life WHILE travelling the world AND get the same quality healthcare if I threw 25k on top on my planned expenses. How many of the countries with socialized medicine will treat a foreigner? I heard stories about US people getting hurt in Canada and having to pay next to nothing in health care costs. That's hard to believe. My GF is in health care and they need every dollar they have plus a few more so they won't be giving away health care to folks without insurance for free. I mean they will of course treat you in an emergency, but they will also bill you for everything. Even if I pay full boat as a foreigner, the costs are reasonable compared to US costs. Throw in some travel insurance to help defray those costs and it's definitely a viable alternative. Medical tourism is booming in plenty of countries with top notch healthcare. The UK will treat visitors for emergency care for free. My daughter "broke her arm" in British Columbia, Canada while skiing. We had to pay $700 on the spot at the emergency room for XRays and the diagnosis. Took several hours. When we got home to get a cast on, the doctor here took an XRay and said it was not broken at all. Gave her an ACE bandage for the sprain which was fine in 2-3 weeks. Sometimes the concept of wonderful, perfect, FREE foreign healthcare is just a fantasy. There is stupid everywhere and it certainly was not free. A misdiagnosis is unfortunate but had you gone to the ER in the US without insurance the bill would have been thousands, not $700. That's what I mean by the cost of care in other countries is reasonable. Most Walk-in clinics/urgent cares have Xray capabilities. If it wasn't broken I'd be well under $700 for a single view Xray and an ace wrap. ER's are expensive because they are for emergencies. So what exactly is the 'Trump Adjustment' on the 4% Rule? Because I can see how the 4% Rule was OK for ER in the 'irrationally exuberant' times of Greenspan (Regan, Bush, Clinton) + deregulation/tax cuts, internet, low oil price. It's more questionable in times of trade wars, less social services, and political instability. Commodities like gas prices are outpacing inflation, medical prices are going back to unaffordable, and unions just lost their lifeline. Inflation and the Fed raising interest rates. Ultimately, it's a further acceleration of the rich getting richer (and increasingly expanding what it is to live the good life) vs. the labor force losing jobs and living 'well' but not good, struggling to get ahead, and ultimately going into debt to try to provide a better life for their children. The 'American Dream' is quickly becoming something to scoff. Wait a second, you aren't meeting up with Trump this weekend at Mar-a-Lago but you think he is working on your behalf? Good points! Maybe you can add your Trump Adjustments to the end of this graph? So with this entire thread about the 4% rule you think it's solely based in those "irrationally exuberant" times and not all the other things that happened between 1925 and 1995 that the original Trinity Study took into account? I'm much less confident in history (especially historic data when very few people owned stock and Index funds didn't exist) these days, yes. But feel free to disagree. Only the future knows which of us is right, but the past tells us very little IMHO. Just because it's the best we have is not a good reason to use it. That's a fun graph. One thing I notice though is that the points do get a little more sparse (and less serious sounding) after 2008-2009, especially compared the the 90s and the earlier 00s' It may be what we're seeing is that people have gotten out of practice with feeling like the world is going to end/society as we know it is gonna collapse, so those feelings are more uncomfortable than they otherwise would be. Like how the first 100 degree day of summer makes you much more miserable than the same temperature after it's been that hot off and on for months. Just because it's the best we have is not a good reason to use it. So you are suggesting we should use something worse then? Like pretending we can predict future returns or working many extra years to hit an absurdly low WR? If historical data is the "best" we have it does make a lot of sense to use it when developing FIRE plans. However, as has been stated here like a million times a small amount of flexibility gives your FIRE plan a huge amount of resilience and doesn't "cost" much. If you are not prepared to be flexible and/or are pessimistic about the future the "cost" is significant in terms of your most valuable resource....time. I notice they are missing a few items. Brexit is a divot in there somewhere, end of June 2016. A one day, huge divot. And Monica Lewinsky and presidential impeachment is not a thing here, that was good for a dive... ahem. Brexit may be just off the end of the graph (I noticed that there were tick marks for 2004, 2008, 2012 but not 2016, which may indicate the figure was put together in late 2015). I'd say '16 '17 '18 have been a reversion to the mean in terms of how much evidence we're presented with about how we're all going to die and/or be living in the world of Mad Max. It may also be an over correction well past the mean. I struggle to make the comparison since in the '90s and early '00s I just assumed that was the way the world always was. I made a fair bit of money during the Brexit Vote.. We were on our way to Thailand and I saw the vote and in the airport terminal dumped the remainder of my cash into VTSAX.. Then didn't see the market for another 3 days.. I think I paid for the entire 8 week vacation by that point..:). I'm not trying to rehash everything, more so I am trying to head in a slightly new direction (even if I may not reach a very satisfying destination). 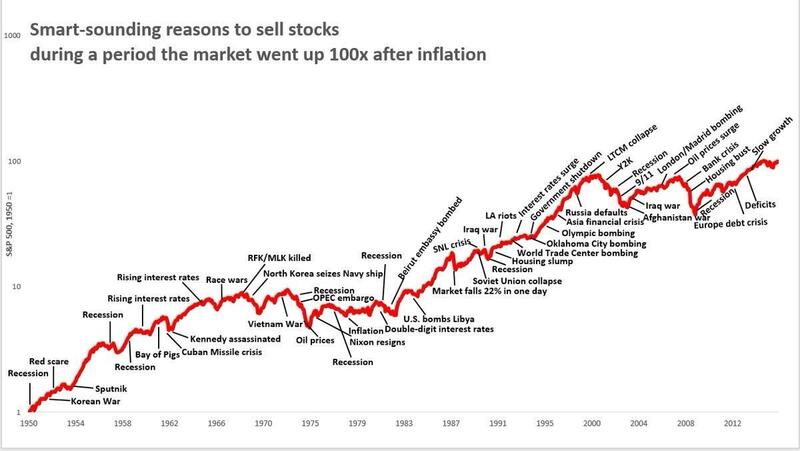 I'm trying to say we should not take US stock market history for granted that it is a predictor of anything going forward. This isn't a crazy call to ignore it, but more a call to deeper independent thought on how it has changed (especially in the case of participants in the stock market now vs. the whole history of the data set). We are currently benefitting from a time of relatively unbroken growth and reduced volatility in the US (the great moderation) and did benefit greatly from increased access to the financial markets and capital. But maybe, going forward, it has come to an end and we begin to experience more downside. Going from globalization back to protectionist trade policy was just one Trump effect. Seeing just how much change can be effected in one year got me thinking about how the next 30 years probably won't look anything like the last 30 years. Another niggling thought I can't shake is that if the concentration of wealth continues its exponential trajectory for the next 30 years, economic growth in the US will certainly slow down. I'm trying to say we should not take US stock market history for granted that it is a predictor of anything going forward. This isn't a crazy call to ignore it, but more a call to deeper independent thought on how it has changed (especially in the case of participants in the stock market now vs. the whole history of the data set). The problem is that one of the biggest things historical stock market data teaches us is that whenever people have tried to make predictions about changes in the long term trends of the stock market through reasoning based on existing factors and projecting current trends into the future, they've had extremely limited success. Projections from historical data could certainly be wrong about what the stock market will do. I don't disagree with that. What I do disagree with is that I don't we're any more likely to make accuracy predictions by putting out fingers on the scale to push things in one direction or another than all the people who have tried to do so in the past. If you're not comfortable with using the past as a reference point then you literally have no reference point. Nothing is safe. How are you comfortable with anything other than dying at your deask? Yes, and? What is your actionable item that you're putting forth as a result of this analysis? What should people put their money in if not the S&P500? That can't be so bad... I can invest in pillow keys to soften the blow as my head hits the desk. In other news two years of one president's policies and the world is going to never be the same. Queue shocking reveal music. Coworker A: What?! What did you say his last words were as he died at his desk? Coworker B: I swear I heard him say, "Hash tag winning!" Now I know what to put on my gravestone. Thanks Mr. Green. I'm not saying that it's actionable for everyone (like if you are just getting started building a portfolio), and certainly not the same action for everyone, but when you are ahead of the game it is prudent to dial back exposure to risk and volatility. Given the exceptional returns we have experienced since 2009, high stock exposure and 4% SWR is not my best bet. Everyone here seems to think they have high risk tolerance, but I'll be interested to see how they feel in the middle of a bear market, especially if they are retired. Fortunately I only need 2 - 3% WR currently, but that assumes inflation stays tame until I get to Medicare and SS. I will probably ER in a year or two depending mostly on circumstances outside my finances (other than healthcare, I might still work to have access to my company plan). Anyway, Financial Samurai has posted a bit about this recently (https://www.financialsamurai.com/ideal-retirement-scenario-conservative-returns-and-a-steady-income/). It's all risk. Life is risk. And 10 people have 10 different opinions about whether we're going to have a period of low returns. This is one of the big reasons why I'm keeping a year or two of my living expenses in cash. I don't want to be looking at the markets quarterly or monthly during a recession and having that mental battle about not wanting to sell assets in a down market. If you can put your head in the sand for two years while the market is down, you've missed all the panic and fear. You can just keep on rocking. The thing I think most working people don't understand is just how easy it is to be oblivious if you choose to be. I have no compelling reason to remember what day of the week it is, what the Dow Jones number is, or what is going on in the news. I'm doing my FIRE thing and it's real easy to get lost in living your life. So I think it is completely reasonable to think you can go through a recession as a FIRE'ee with little to no mental anguish if you have a good plan that allows you to tune out the noise. This is (attached picture) my view, and has been for the last couple hours. As for what day or the week it is? I'll quote another retiree I once knew. "I don't care!" The thing I think most working people don't understand is just how easy it is to be oblivious if you choose to be. I have no compelling reason to remember what day of the week it is, what the Dow Jones number is, or what is going on in the news. I'm doing my FIRE thing and it's real easy to get lost in living your life. That sounds good and the picture looks good. I guess if I wasn't working we would have the freedom to hike for an extended period in some place with magnificent vistas. It would be a place 4% closer to heaven. So the answer to the possibility of stocks "maybe" having a low return is to shift your assets to something that's guaranteed to have a low return (bonds)? Uhm, what? BUT, having said that, my take is that during accumulation you generally are able to deal with market dips a lot more easily. In retirement that changes. But I have a few hedges that I'm going to use to deal with what I believe is the biggest threat to FIRE: low or negative returns during the first 10 years of FIRE. Like Mr. Green, I'll have 2 years cash to live on if there's a massive dip. I'll also have a paid off house, so if S really does HTF, at least I don't have a mortgage payment and my house is not at risk. I'm also over-estimating my FIRE budget a bit, mainly to give myself more flexibility and wiggle room from year to year. And I won't be 100% stocks, it's 80/20 for me, and even the stocks are split between US and World. This is one of the big reasons why I'm keeping a year or two of my living expenses in cash. How does this cash allocation factor into your overall AA? I'm assuming that this cash in addition to your invested portfolio from which you would withdrawal your 4%, and not part of your 4% calc, right? So couldn't you just re-frame this as using a lower WR? Portfolio + cash = total portfolio = WR < 4%. True. Although I tend to think of the cash more as an emergency fund. Emergency funds are good to have. The cash is part of my "fixed income", or bond allocation. However, the reality of our situation is that we probably won't hit a 4% WR because we just don't spend that much. We sold a property that we thought we'd build a house on so our stash is about 200k heavier than we planned for. We also have someone giving us 8k a year for a land lease so that's 8k less we have to pull out of the stash, though it may not run long term. We had planned to spend 40k in FIRE, or 4% of $1 million, and this year our spending is on target for 36k. Though a true 4% WR for us has now become 58k with the unplanned income events. A bit simplistic and not aimed at early retirees. 1. Tax advantaged retirement accounts have Minimum Distribution requirements. 2. The minimum distributions are required, but might not be the best amount to take. 3. You might want to consider developing an investment plan and budget to know what is best for you. A few thoughts I got out of this - having 2 years of WR in cash either means you have an effective SWR of 4.3% (if the cash is not part of your investments but you count it that way) or, more likely, a conservative 3.7% SWR (having 80k extra on a 1M portfolio spending 40k/yr, all nominal). It's also easier to stop worrying about the 4% rule when you hit 50 and older due to being 'able' to hold a bond allocation, knowing all you have to do is get to 65 for Medicare and SS. At 40 and younger, you both can and need to hold stocks to counterbalance longevity risk, but then you are exposed to sequence of return and inflation risk. I'm still unsure about the 4% rule for ER's in the 40 - 50 age group. In some cases bonds and cash will be prudent, but they still need to lean heavily on stocks. I guess we will see, since this forum is going to be the hub for young ER's in a time of high PE's, except it still seems that most err on the side of caution around 4% and sub-50y.o. ER. Not that there's anything wrong with that :) still doing better than the Boomer generation. I created a blog that doesn't really get any traffic, more so I would have a record 30 years from now about how life turned out based on retiring early under the conditions that are advocated for here. I suppose by then the youngsters will either have a whole bunch of examples about what not to do in life or a whole lot more confidence pulling the trigger because there are so many well documented examples of success. It's also easier to stop worrying about the 4% rule when you hit 50 and older due to being 'able' to hold a bond allocation, knowing all you have to do is get to 65 for Medicare and SS. Yes, the added SS benefits definitely help. Full retirement age is 67, so you would take a cut in benefits if you started taking them early at 65. Also, I wouldn't want to live on SS alone even starting benefits at FRA, so I want my stash to last past 65 and 67, although I have calculated I will be able to reduce my WR to 2% or less since SS will cover at least half. So, with SS after 15 years of FIRE, cFireSIM gives me a 100% success rate based on expected expenses and desired discretionary spending. Only real concern for me is ACA / healthcare. Fortunately I only need 2 - 3% WR currently, but that assumes inflation stays tame until I get to Medicare and SS. 1) Some disagreements about withdrawal rates are caused by lack of knowledge on one or both sides, and these discussions then to be highly productive. 2) Some differences in withdrawal rates are caused by differences in tolerance for risk or (perhaps more importantly) tolerance for uncertainty. These discussions are perhaps not as productive, but still seem to be interesting to both sides. 3) Some differences are caused by the sunk cost fallacy and tend to generate the most heated discussion for the least potential benefit. With both the posters I've had the least productive interactions with on this forum (and EV I certainly don't put you in that camp! ), it later emerged that both had worked many many years past when they could have retired and now had assets equal to 40-60x annual spending. When a person has put in those extra years of work, I'd imagine it really feels much better to be able to tell themselves that those extra years of work bought them additional safety and freedom from uncertainty. So in these conversations, one side felt attacked by people who think they wasted years of their life, and the other side felt attacked by people who are trying to talk them into wasting years of their lives. And what is to be gained? If I can convince a newbie who is aiming for a 2% WR that they can be comfortable with a 3.5% or 4% WR I may have helped in a little way to given them a few extra years to pursue whatever gives them happiness or meaning in life. If I convince a person who has already saved 50x their annual expenses that they didn't have to save that much.... it probably doesn't help them at all. Good points MM. The bolded text is why I continue to post in this thread. I'm not trying to convince someone already at 2% WR they made poor choices. As you note those decisions are made. But, I do think it's valuable to point out the opportunity costs and the other potential FIRE failure modes beyond going broke to folks who are still a ways away from a 4%WR. It's important to see beyond money and realize that at some point trading more of your life and your health for $$ you don't need increases your risk for FIRE failure. It seems very common to overestimate the risk of running out of money once you get to a 4%WR with a modicum of FIRE plan flexibility and to underestimate the risk to your health and personal relationships by continuing to work full-time at the typical sedentary desk jobs most of us professionals have. Yup, and I agree that is important work, RC. Keep fighting the good fight. I can totally understand how someone with 40-60x annual expenses learning that 25x annual expenses is likely all they'd ever need could take it personally, like an attack. Like Retire-Canada, my participation is directed toward those still learning, or undecided. No good comes from telling someone they could have retired sooner. Hopefully those folks are able to let that go as the past being what it is. We could have retired years ago, easily in our mid-20s if we knew what we knew now but I'm not going to get hung up on that. Instead, I'm going to be grateful that we're in the position to enjoy many years of not working, and try to always take maximum advantage of the time I've been given. Knowing that statistically I have about a 1 in 5 chance of being dead by 65 helps keep things in perspective. Carpe diem, baby! I think it is very difficult to see the downside of continuing to work. It's all you know, and you can't even imagine how much healthier you will be when you are no longer chained to a desk. I'm 6 months FIREd now, and I'm amazed at how much less stress I feel, how much better I sleep, how much better my back feels, and how much girth I've lost. I don't own a scale, but I'm somewhere between 2 and 3 belt notches skinnier, and I haven't even been trying to lose weight. I probably could have pulled the plug somewhere between 12 and 18 months sooner than I did, but at the time all I could think about was "what if I don't really have enough?" I mean, I'm glad I have the buffer that I built up, what with all the health care uncertainty in the U.S., but if I would have known just how much easier it is to stay healthy without the daily grind at the desk, I might have reconsidered that extra O and a half MY. Yes you've hit the nail on the head. Having been programmed to work and consume your whole life how can you even rationally decide if working more is a good idea? You really don't have a basis to make the decision on and frankly it's always easier to stick with your programming than fight against it. So people will grasp for any number of OMY reasons even if the real reason is it's just scary to face a huge life change. Let's look at it another way if I told you someone you cared about had a compulsive habit they were having difficulty stopping and that was harming them you'd be worried and want to support them to make the change. If it was drugs/smoking/gambling/overeating/etc... there would be no controversy and just about everyone here would agree that that person needed to change. OTOH if the problem was work...particularly sedentary work suddenly there are all sorts of justifications for it to continue well past the point where an enormous amount of wealth has been accumulated. We look back and see smoking as the scourge of one generation, then sugar and I am fairly confident sedentary computer work will be the smoking of the current generation. Just like smoking or sugar...work is not something that's easily given up...especially by the typical MMMer who is a professional and has so much of their personal identity wrapped up in the career. Just like smoking or sugar in any one moment the health risks are not obvious. We could all go smoke one pack of cigarettes or eat a dozen donuts and have no serious health impacts. Just like picturing one more day at our desks seems so trivial. But in all these cases decades of abuse takes a huge toll on our lives. In the case of work it's worse than just our health that's being impacted it's also our personal relationships. If you ask a typical OMYer what's the most important thing in their lives hearing their wife/husband and kids would be a pretty common response. But, you have to wonder if you voluntarily choose to continue working 40-60hrs a week for money you don't need and once chores/sleep/non-quality time is accounted for only have maybe 20-30hrs for the family can you really say they are your priority? Personally I don't think so. You can do the same calculations around your health and come to similar conclusions. After all time is the most precious resource any of us has so when you really want to know what some one cares about or prioritizes you can just look at where they allocate their time.